For most people the morning of your wedding is a time for last-minute preparations, making sure everything is in place for the big day. 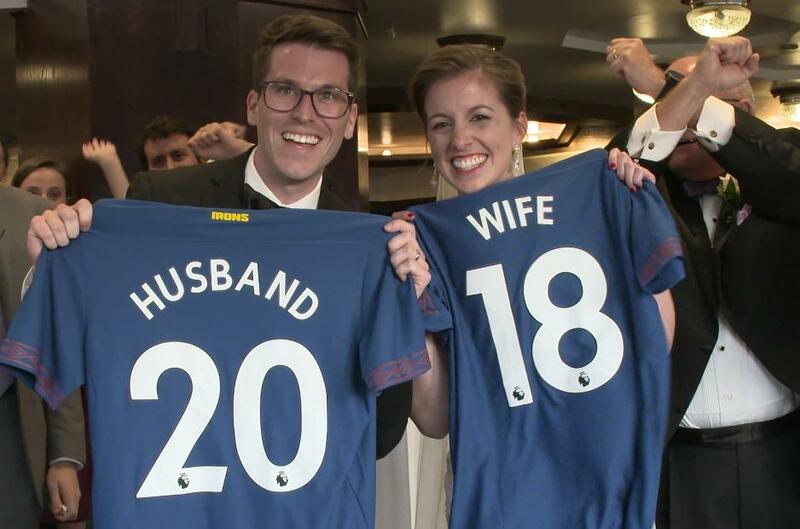 But West Ham United fan Andrew Tomlinson was so keen to attend the “Premier League Mornings Live” fan fest with NBC Sports in Washington DC last month that he headed there before tying the knot later that day. His beloved Hammers kicked off their match against Manchester United at 07.30 ET so Tomlinson had to make an early start from his Arlington, Virginia, home on his special day. But he was rewarded for his effort as he watched West Ham win 3-1, surrounded by about 2,000 fellow Premier League fans. He was also given a memorable wedding present as West Ham captain Mark Noble sent a personalised video message to the happy couple. "It’s just a regular day, other than getting married this afternoon!" said Tomlinson. Fortunately he got few complaints from his wife to-be, Alyssa. "She pressured me to come," Tomlinson said. "She thought there’s no way I could miss it." A love for West Ham runs in the family. "My dad has been a West Ham supporter since he was a kid, after he saw Bobby Moore do a US tour following England's World Cup win," said Tomlinson. "So in 2012, when I decided to recommit myself to the Premier League, it was the year West Ham had been promoted from the Championship and it naturally made sense to back the Hammers. "I’ve been to a couple of matches. As a child I lived in Birmingham and my family went to a Coventry v West Ham match. Then this year I attended West Ham v Wolves in the London Stadium. "My future wife Alyssa is of Polish heritage and she roots pretty hard for the Poland national team, so for the sake of my future marriage I’m going to say my favourite player is Lukasz Fabianski."